We rarely get to the theaters these days, what with the two little bumpkins and what not. A trip to the movies would cost us a small fortune. 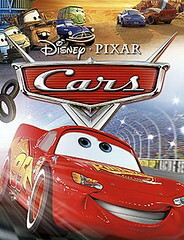 But we almost ponied up the money to see Cars when it hit theaters earlier this year, which is to say we really wanted to see it. Thrift overcame desire, however, and we decided to wait for the DVD. My mom and dad were kind enough to buy it for Luke and Jake, which thrilled Lauren and me since we wanted to see it just as much, if not more than, the boys did. Well, we’ve seen it, and it’s as wonderful as we had hoped. Pixar has never let me down, and they didn’t start with Cars. I never thought I’d see a buddy comedy with Owen Wilson and Larry the Cable Guy, but alas here it is. And perhaps it’s not completely accurate to call this a buddy comedy; it’s Owen Wilson’s movie. And as usual, there’s a great supportingig cast of eclecticic characters — from the hippie VW van Fillmore to the military jeep Sarge, who, naturally, runs the local Army Navy Surplus store. The animation is amazing. Some of the shots looked almost real, like one of a closeup of a fluorescent light with flies buzzing around it. I’m constantly amazed at how Pixar uses light, particularly in places like the huge speedway. To think that each one of those twinkling flashing lights is an intentional stroke of the animator’s brushes makes every frame of Cars a work of art. I laughed out loud. And although I didn’t tear up at the end, I got pretty close. This is a wonderful family film for kids and adults alike. Bless you, Pixar, for giving it to us. My only disappointment was that there were too few special features on the DVD. The two animated shorts were a nice addition, but the abundance of special features on The Incredibles DVDs made Cars‘s special features feel a little empty. I wanted more “making of” documentaries. And I always love seeing the cast recording their voice overs. There was none of that here. But other than that, this is a worthy addition to any DVD collection.